Moms of young children face a sometimes-overwhelming burden in the care of their little ones. Whether needing the strength of God's Word to carry them through labor and delivery or encouragement through those middle-of-the-night feedings, these memory verse cards offer biblical truths to shed light in the darkness for new moms and moms of young children. The set includes 15 Bible verse memory cards taken from the Bible translation of your choice. The verses are specifically chosen to remind moms of God's promises to carry them through the challenging moments of motherhood. These Bible verse cards measure 5 3/4" x 4" and are handmade from top-quality materials, including 10 mil laminate, and are spiral-bound. Tuck them in your purse, diaper bag, car, or next to your bed for quick access. They will even stand freely on a desk or nightstand! 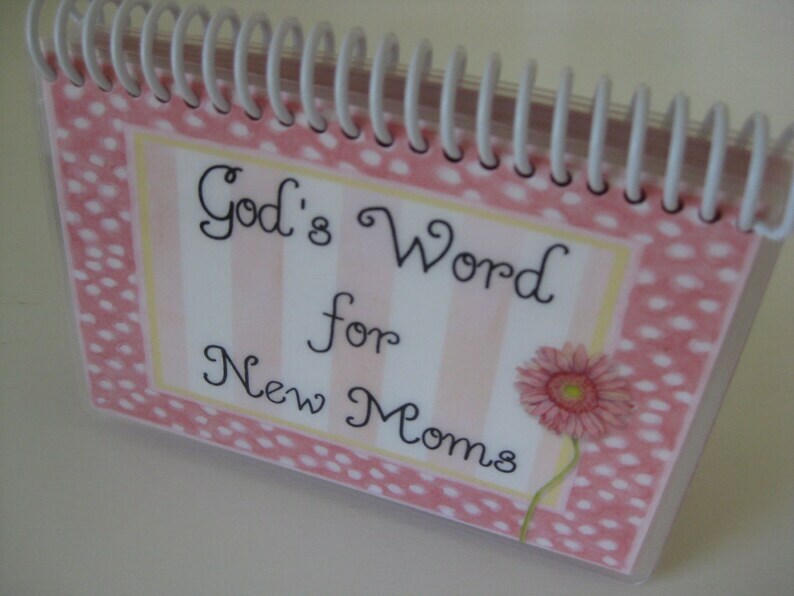 "God’s Word for New Moms" makes a great baby shower or new baby gift and comes nicely packaged. **"God’s Word for New Moms" can be PERSONALIZED with the name of a special mom for only $5 more!